As guest blogger today, we welcome Dr. Laurence Becker, an educator and advocate for the autistic community and creative savants, who is also an award-winning film director and producer based in Austin. Dr. Becker first tackled the subject of autism and artistry 35 years ago in his film Eyes Wide Open, about artistic savant Richard Wawro. His new film, Fierce Love and Art, premieres on Mother’s Day, Sunday, May 13, at 7pm at the Performing Arts Center of Austin ISD. You can learn more and support the film via the website. You can also see art related to the film from February 25 to April 8 at Hyde Park Bar & Grill. To journey and to be transformed by the journey is to be a pilgrim. My real mission with Fierce Love and Art is to open the eyes of the world. We need to realize that all of us are related, and we can all make the world a better place. In the film we meet individuals with autism and other disabilities who have been able to transform their own lives and contribute to their communities through art, music, and words as a result of powerful support and love from parents and grandparents. Some of the incredible people we meet and spend time with in the film include savant musician Tony De Blois, who plays 23 musical instruments and sings in 11 languages. Tony is a Berklee College of Music graduate who plays in a jazz band and composes original music at his home in Boston. Sadly, one of the young people we had the honor to work with for the film passed away in 2016 as a result of an injury connected to her epilepsy. Kimberly Dixon was a warm and lively spirit who wrote poetry and painted as a way of connecting with her family and community, despite being nonverbal in a verbal world. I’m eager to have everyone join us in May to see these amazing stories. To me they’re a real testament to what happens in the lives of children with autism when their families fiercely take charge of their development—and also a testament to the power of art in all our lives. It’s a little late, but as Autism Awareness and Acceptance Month comes to a close, I wanted to make sure to highlight some of the great work being done for Austin kids on the autism spectrum. Autism is a collection of neurological, developmental disorders that used to be divided up into many categories, but now researchers believe they all are variations of the same thing: Autism Spectrum Disorder, or ASD. The CDC estimates about 1.5 percent of kids in the United States are on the spectrum, and it’s something they’re born with, not the result of any trauma or environmental factors. Kids with ASD often struggle with communication and social interaction, have heightened sensitivity to the world around them, and sometimes have some trouble with motor skills. The Autism Society of Texas (formerly the Autism Society of Central Texas) has loads of materials for parents, children, and educators who would like to become advocates and allies—or just want to know more. Their website also highlights camps for kids on the spectrum in the new 2017 Recreation & Camp Guide for Students with Special Needs, available in English and Spanish. One of the best ways we can become good allies for kids with ASD is to help everyone learn more about it, including children of all ages. I can recommend Amethyst Schaber’s YouTube channel and especially her “Ask an Autistic” feature for its straightforward answers to common and not-so-common questions. Amethyst’s friendly face and voice will help younger children understand that ASD isn’t a scary thing and that some of the common “stims,” or forms of stimulation used by people with ASD (like hand waving or eye movements) are nothing to be afraid of. For those who would like a resource in English and Spanish, make sure to take a look at Autism Spectrum Explained. This website was created by a college student whose sister is on the spectrum. The clever videos show viewers that different doesn’t mean non-functioning—in one case by using the analogy of PC and Mac operating systems. Many schools in Austin and surrounding areas offer services tailored to children and teens on the spectrum within inclusive learning environments. These include alternatives like The Rise School of Austin, William’s Community School, Odyssey School, and The Magnolia School, as well as St. Francis School. For a complete list of ASD-friendly schools and other educational programs, go to the Autism Society of Texas 2017 Resource Guide, which offers links to education resources, both private and public. Alt Ed Austin is honored to share this moving story from guest contributor Jenny Lockwood. 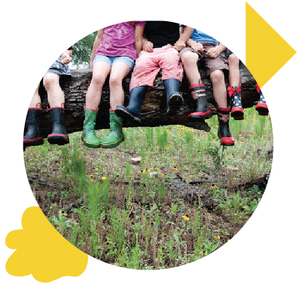 Jenny is an educational psychologist and alternative educator who works with a child known worldwide as The Horse Boy and with other remarkable children and their families at Horse Boy World in Elgin, Texas. In April 2004 Rowan Isaacson was diagnosed with autism. At the age of two and a half he suffered from neurological tantrums that could last for hours and that his parents were powerless to stop. He could repeat long passages of text from his favorite books and movies but was unable to tell his parents he was hungry, thirsty, or tired. He was incontinent and unable to make friends. At age three his speech therapist “gave up” on him and told his parents that he would never use expressive language. That was almost ten years ago. Rowan is 12 now, and earlier today he told me that he wanted to open his own zoo to provide “a forever home for animals that are abused and neglected.” He is ahead academically, has friends of all ages, and wants to help other special (his word) kids like himself learn to talk, read, and write. So what changed? When he was almost four years old, Rowan ran away from his father, Rupert, into their neighbor’s horse pasture and threw himself down on the ground in front of a horse called Betsy. His Dad, a lifelong horse person, was terrified that his precious son was about to be trodden on and certainly did not expect Betsy to lower her head and begin to sniff and breathe on Rowan whilst he giggled in delight. From that moment onward, Rowan and Rupert lived in the saddle together. And the more they rode, the more Rowan began to talk. You can learn more about this story and the family’s subsequent trip to Mongolia in the book and film The Horse Boy. Around the same time that Rowan met Betsy, his parents made the difficult decision to pull him out of school. He had been stuck all day in a windowless classroom with unmotivated teachers who kept the television turned up loud to drawn out the noise of the kids. Rupert began to homeschool Rowan, and Betsy was a huge part of that. They did a lot of learning, from letters and numbers to reading and writing to basic arithmetic and fractions, up there in the saddle together. When Rowan was on the horse, he seemed to be in an ideal position to soak up new information and make it his own. Over the years we have discovered that the reason this works is the movement that the horse provides. Children with autism are often kinetic learners, meaning that they need to move in order to be able to learn. Force them to sit at a desk, and all they will learn is how to sit at a desk. Allow their bodies to move, and their brains will be free to receive and retain information. I have been Rowan’s main teacher for about five years now. We discovered how important movement was to his learning after I had been working with him for about a year. Back then, we still did all his academics inside at a desk but allowed him frequent breaks to go outside and bounce on the trampoline or ride. We always supplemented what he was doing on the horse, of course, but when it came down to “serious” academics, we went inside. Then one day I decided it was time to start his multiplication tables. He flew through his 0 and 1 times table, but when we got to the 2 times table he began to struggle. The more he struggled, the more he rocked in his chair, so that he eventually fell off and the chair fell on top of him. That seemed a good time to take a break! 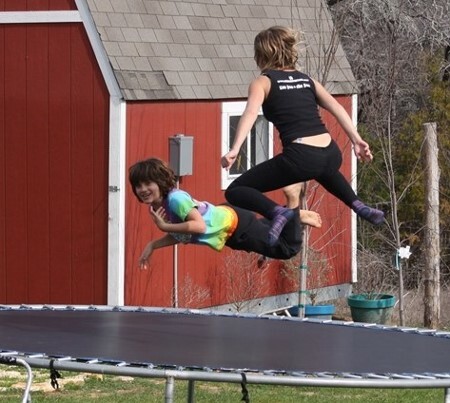 So outside we went to the trampoline to blow off some steam. Then I had a brainwave: Why not learn the multiplication tables outside whilst bouncing and having fun? He loved the trampoline, so he was motivated to be on it . . . maybe the movement would help him pay attention? By the end of a 30-minute bounce session, he had already mastered the 2 and 3 times tables. By the end of the week, we had done all 12 and were moving on to division (and I had lost more than a few pounds to boot). It was so successful, in fact, that from that day onward we abandoned any thought of trying to teach Rowan at a desk and instead created a whole curriculum for him based around movement. He learned angles through chase games and equations through treasure hunts. We discovered how to calculate the relationships among speed, distance, and time on bike rides and did force, mass, and acceleration through wheelbarrow rides. What’s more, we began to try the same techniques with other children—some on the autism spectrum, some not—and it worked just as well, as long as the games and activities were adapted to those kids’ interests and passions and we incorporated movement, movement, and yet more movement. We now work directly with hundreds of children on the autism spectrum each year and indirectly with thousands through the trainings we provide for equine professionals, teachers, and parents. To find out more about our work, please visit our website or contact me at jenny@horseboyworld.com.